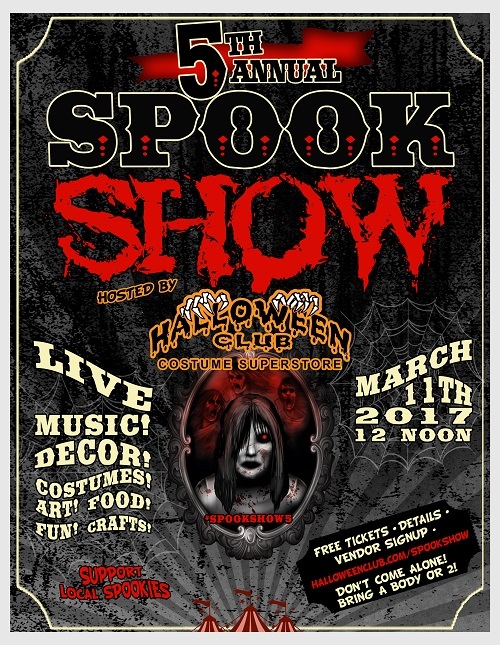 The event will again be held at the Halloween Club in La Mirada, California on Saturday, March 11th, 2017 from noon to 7PM and will feature over 100 local vendors, artists, haunters, musicians, and more for like-minded Halloween enthusiasts. The Halloween Club itself will host its biggest sale of the year with thousands of costumes, accessories, and decorations at discounted prices. Entry is free and you can reserve your free tickets HERE! If you celebrate Halloween everyday, this is the perfect event for you and I hope to scare you there! You can find the full list of vendors, entertainers, musicians, and more HERE! Don't forget to get your free tickets before the event HERE! Make sure to RSVP and invite your friends to the Spook Show 5 event on Facebook!